GeekBytes: Musical Microwaves. And Washing Machines. In Space. GeekBytes is back for November 17, 2011, and today we're checking out the world of robotics. Looking for some Christmas ideas and gifts? GeekBytes has it. Robotic pillow to stop the snoring? Here it is. If you have made a robot that you want GeekTech to cover, email us the info on geektips [at] pcworld [dot] com. Don't feel like being the one to serve up the drinks at your upcoming Christmas party? No problem, just get iZac on the case! iZac in an Android-based bot by Nick Johnson that you control using a tablet app. Select your cocktail and the robot (controlled by the Android ADK) will do the rest. It makes the measurements are perfectly since it weighs the glass before pouring, so no being under-served or even over-served. Check out the video below to see how iZac works. Retirement homes are about to get even more interesting for their residents. the Kustaankartano Elderly Centre in Helsinki, Finland is testing robots that not only aim to keep pensioners amused, but also help them with their memory and mobility. Whatever helps the elderly with their aches and pains and them laugh is a good thing, as far as I'm concerned. My one qualm: Two of these robots (pictured) have those creepy, Furby-like eyes that always scared me as a child. YLE has the full breakdown of what each robot helps the elderly work on. If you want your kids to follow in your geeky footsteps, perhaps get them this cute Lego robot game. That's right, robots and Lego in one box. 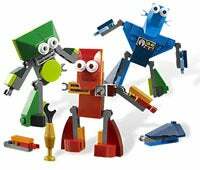 The object of Robo Champ is simple: Be the first to build your robot in your own colors, working your way round the scrap heap with Lego die. If you happen to get another color part, you can trade it with other players. Actually, who says this is just for kids, hand it over! Get it over in the Lego online store for a mere $3 on the sale.